Shortly after Jim was assigned to PT 209, he found himself gearing up for his first big operation. 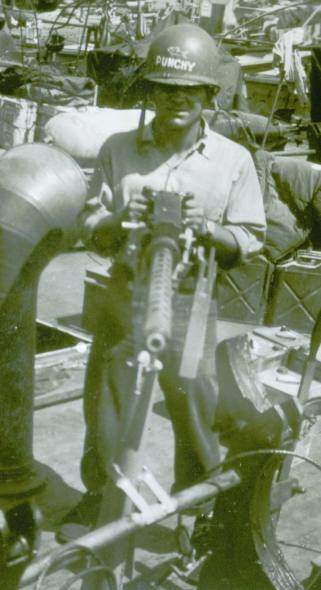 The Allied invasion of the island of Elba was on deck and Pop's introduction to combat was one he never forgot. Elba was a German-held island outpost between Corsica and Italy. The island was surrounded by a "great number of mines" (At Close Quarters) and this meant that boats and ships with shallow drafts like PT's would do most of the sea work for the invasion. 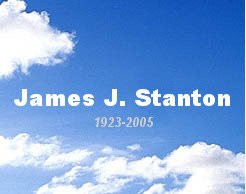 Plans were set for June 16/17, 1944. According to MTBRon15 Action Report No. 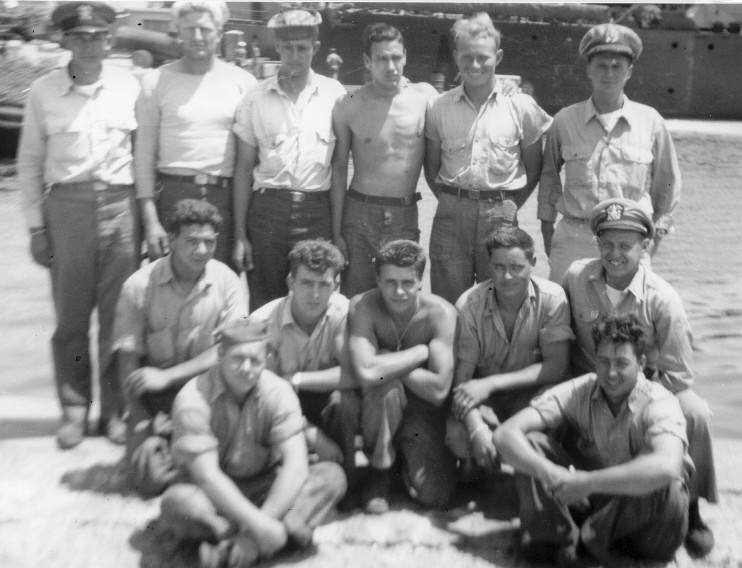 44, which is dated July 26, 1944 by Commander Boat Squadrons, Eighth Fleet (Stanley Barnes), there were nine groups of PT's taking part. 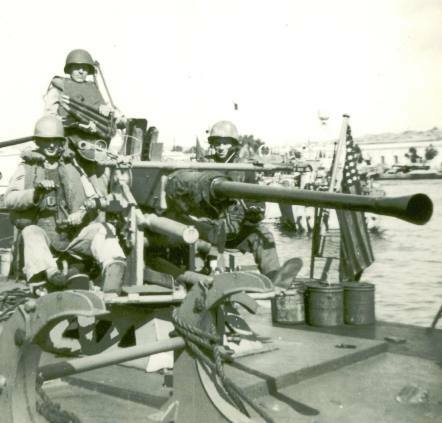 Folbert Group was comprised of PT 209 and PT 210 under the command of Lt. (jg) Harold J. Nugent in the 210; their mission was to get six commandos onto the southern coast of the island. The soldiers were to sneak ashore and act as human landmarks for the troops that would soon land on the beach. Once that was completed, the two boats were to meet at a predetermined point and then to start a standard combat patrol to help provide protection for the coming invasion fleet. Both boats left after dark on the night of the 16th from Porto Vecchio on the southern end of Corsica. PT's 209 and 210 approached Capo di Piero on the southern coast of Elba and split apart; the boats (because of their destinations) ended up about three miles apart from each other. The 210 had a problem though; a German E boat was patrolling the area they were supposed to make their drop in. Lt. (jg) Nugent adapted the plan and slid a short distance away, slipping around the E boat so they could still drop their human cargo. According to the action report, PT 209 made their drop at 2235; PT 210's detour meant their drop took an additional 40 minutes. After the PT's successfully dropped their commandos they started back to the roundevous point. There was another problem though; the E Boat that the 210 had run into earlier was still in the area. Pop and PT 209 were heading back according to plan, however that plan was taking them right towards the enemy. They apparently thought its radar return was that of PT 210. Narrowly avoiding a potential disaster, Nugent broke radio silence at the last minute and warned the 209 what was about to happen. Skipper Lt. (jg) James MacArthur sneaked the 209 around the E boat and the elements of the Folbert Group rendevoused just before midnight. According to the action report, while the boats were joining up, the 210 picked up a "small target" two miles south of Capo do Poro (Capo di Piero) and a large target three miles south of Punta Fetovia (Punta di Fetevaia). At this point the large target was only 2500 yards from the PT's as their patrol took them west. Radar only can tell the crew so much, so the question was this: are the blips enemy ships or the Allied invasion fleet? Nugent set both boats up on a torpedo run on the stardboard bow of the large target. Since this could be the ships carrying Allied troops into battle, the decision was made to challenge the target with a blinker before opening fire. The 210 moved into within 400 yards and challenged the group through the darkness. That identification call was answered with an "unintelligible reply and a broadside of 20, 40 and 88mm" gunfire according to the action report. PT 210 had pulled along side a German F-lighter and was now being fired apon at point-blank range. Nugent narrowly escaped being hit; a pair of binoculars on his chest were hit and he was blown back. Cannon and machine gun shells tore into the wooden boat, hitting the engine controls and switches which then silenced the three Packard engines. The 210 returned fire and for a short while, the two craft were slugging it out face-to-face. PT 210 was in serious trouble; they were stuck without power along side an enemy ship that was pounding them with gunfire; they were so close that in between firing, they could hear the yelling from the German crew. Nugent told Bulkley though that the only thing working in their favor was their proximity to the F-lighter; it saved them from gunfire from the other F-lighter and the escorting E boat in the convoy. Pop was nearby, watching this attack go down. The 209 had retired 300 yards to the east but when MacArthur saw the 210 was stuck, he moved in to draw fire and help the damaged boat. 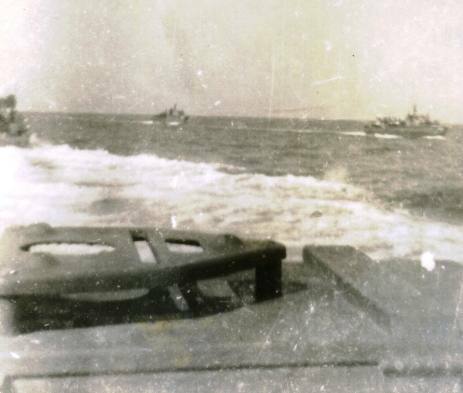 Both boats were firing all of their guns on the three targets and "all enemy fire was silenced except one 20 and one 88mm on the closest F lighter. Screams and cries were heard on this F lighter as it passed close by the PT's." Quick work by the sailors in the engine room of the 210 got the big Packards back up and running as both boats continued to take fire from the remaining guns. The 210 laid down a smoke screen and both boats high-tailed it out of there. The 210 obviously took the brunt of the attack but the 209 was struck by cannon fire at least twice. Ironically, the 210 had several hundred holes shot into it but everyone escaped relatively unscathed (this Nugent family photo shows the crew shortly after the incident.) 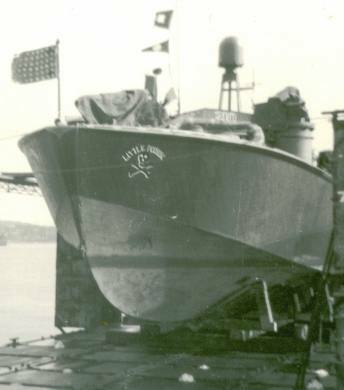 PT 209 suffered minor damage but one of the few rounds that hit killed the sailor acting as the 40mm loader on the rear of the boat. 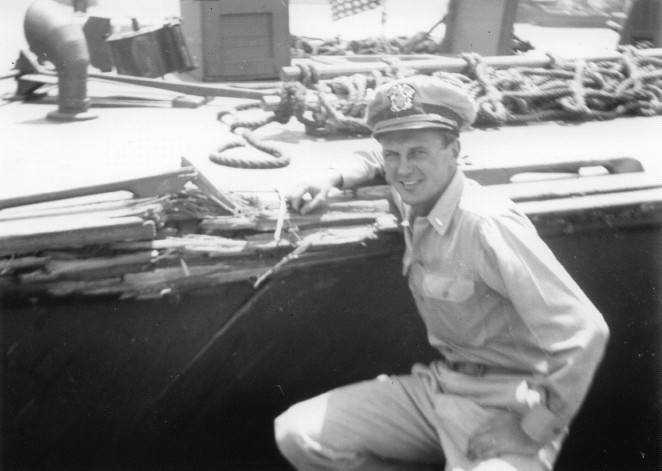 According to Steve Nugent, Lt. Harold Nugent's son, the name Leonard Walters was mentioned in correspondence between Hal and Ed DuBose, the division leader, as probably being the man killed. This name matches one on the PT Boaters Memoral (Walters, Leonard F., F1c) and would appear to be correct. When I was young I collected old artillery brass from yard sales and flea markets. After buying a 40mm shell, Pop told me a brief story about this engagement. He said that the loader had both hands on a clip that bundled four shells together and was in the process of moving from a rack to the gun when an enemy shell hit the clip and shells, detonating as it passed through. He was killed instantly; luckily the two gunners were not injured. It must have been a shocking incident for Pop's first month in combat. Nugent made a report to the senior officer of Force E letting him know of the shootout and the direction of the enemy vessels at last sighting. Despite significant damage to PT 210; both boats made it safely back to base. This photo, submitted by Steve Nugent, shows his father next to the 210 after the engagement; you can see the splintered wood from the cannon hits. Operation Brassard was successful and the island was eventually secured. As Commander Barnes summed it up on the action report, "PT's are useful in amphibious assaults for many and varied tasks. In this instance, nearly all surface support for a sizable amphibious operation was provided by PT's and coastal forces because of the presence of large numbers of mines throughout the area." With Brassard behind them, PT crews didn't get much of a break. A heavy patrol schedule continued for several boats into July. PT 206 Quartermaster Edwin Pink mentions in a July journal entry that "things are tough here in Bastia. 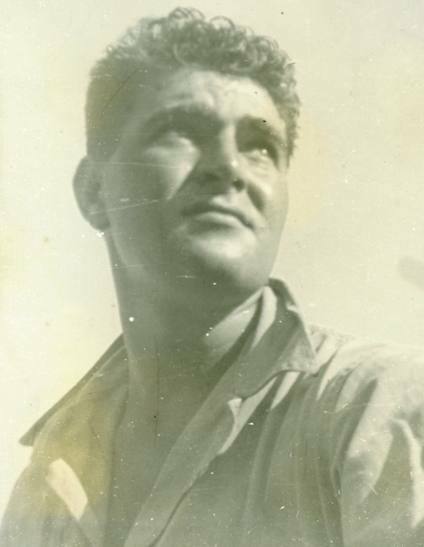 A lot of boats and a lot of men have been shot up in the Genoa - Spezia patrols."